A joint venture with The India Today Group. Many books have been written on Sachin Tendulkar and deservedly so. Sachin has become the highest scoring batsman in both Tests and ODIs, has captained his country in both formats, played to the highest standard for over twenty years and all the while behaved impeccably and become a role model and hero to many people the world over. Considering his exploits, it is hardly surprising that so many pages have been devoted to him. The wait for Sachin to become the first player to score one hundred international centuries had become a somewhat long one. Maybe we were impatient at having to wait almost a year since India won the World Cup in 2011 and, for my part, I returned disappointed from the Feroz Shah Kotla as Sachin carefully and methodically made his way through the 60s and into the 70s in a Test which India would comfortably win. There were enough runs to play with for Sachin, everything was going smoothly but, alas, a sweep was missed and he was on his way for 76 and I missed out on a bit of history. He came close many times but, ultimately, the great moment came in an ODI against Bangladesh. It was inevitable that a book would come out on this historic achievement. So, what of Sachin A Hundred Hundreds Now? Well, It has five photos of Sachin, two of which come during the Little Master’s first century against England at Old Trafford in 1990. It also has a nice introduction as you might expect from another of India’s role models and, indeed, one of Sachin’s most formidable team mates with whom he shared many, many partnerships, Rahul Dravid. Both had the ability of destroying the hearts of opposition bowlers. Nicely, though. This book, though, is not just another book on Sachin but an ideal memento for any reader wishing to have the low down on all of Sachin’s centuries. 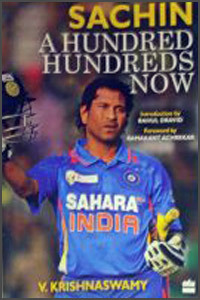 Beautifully presented and very well laid out, this book is so much more than just a journey through Sachin’s centuries. Taken, by necessity, chronologically, each hundred is detailed under the caption of Reliving the Century” whilst also adding the situation of the Test/ODI/series before the innings and, at the beginning of each chapter, a review of Sachin’s previous year. At the end of each chapter, other events which took place in the year concerned and, also very interestingly, two of India’s other sporting stars in other sports, Leander Paes (Tennis) and Viswanathan Anand ( Chess) are compared with Sachin in Parallel Lives and how their endeavours were going alongside Sachin’s on the cricket field. Coupled with a miscellany of titbits of information put under the heading Did you know, this is a most interesting and well-researched book and V.Krishnaswarmy deserves a lot of credit for a fascinating book.